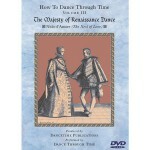 With the third volume of How to Dance Through Time, learn many aspects of Italian Renaissance dance by practicing one famous dance suite, Nido d’Amore (Nest of Love). 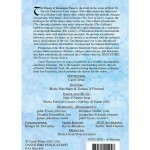 The suite’s four parts comprise a romantic, episodic story of a couple’s courtship and reveal universal love themes. In The Majesty of Renaissance dance, Carol Téten leads dancers through the four parts of the Nido d’Amore. The suite, typically performed and viewed by Italian Aristocracy, begins with a refined introduction (The Opening), explodes with energetic jumps into a male display of bravado (The Galliard), builds to mutual ecstasy (The Saltarello), and culminates in a statement of strong individualism (The Canary).Concise instructions and historical background help today’s dancers create romantic expressions in yesterday’s dance language.Professional dancers demonstrate in period undergarments, which show the feet and allow viewers to learn the steps more easily. A final performance is in full period costume. Most people who buy this DVD also buy the Companion CD. With 40 years of experience teaching and performing dance, Carol Téten provides clear instructions and entertaining context. Volume III is recommended for people with basic dance experience. As with all videos in the How to Dance Through Time series, the dances in Volume III are introduced with a concise, historical overview and illustrated with authentic photographs and drawings. The steps were carefully researched from period manuscripts and are representations of historical dances. Close up and slow motion views make learning the moves simple and fun. 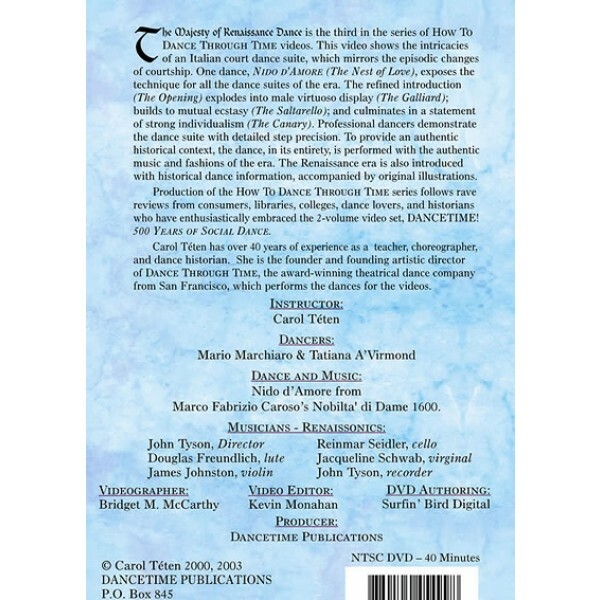 Dance historian and choreographer Carol Téten is an engaging presence in the series, providing historical context and calling out dance instructions as professional dancers demonstrate. Following each instructional section, dancers from the Dance Through Time company perform with authentic music and fashions of the era. Nido D’Amore from Marco Fabrizio Caroso’s Nobilta’ di Dame 1600. Most people who buy this DVD also buy the Companion CD.